In industries where the workers are exposed to risk situations or workplace hazards, it is a requirement by law for employees to wear special kind of protective clothing in order to ensure personal safety and protection. These laws and the level of protection to be observed in different professions are governed by the standards put forth by the local authorities in different countries. So, the need to wear protective clothing (Fire-proof clothing or fire-resistant clothing) in industries such as oil, gas, electrical, mining, manufacturing, welding etc. – has been ever increasing. What are Fire-Proof Clothing and Fire-Proof Clothing? This special protective wear is called Fire-resistant clothing/ Fire-resistant garments / Fire-resistant apparel or even personal protective equipment which also includes further accessories such as gloves, helmets or boots. The “FR” refers to the flame-resistant or fire-resistant and heat-resistant properties of the clothing, by virtue of which a fabric is able to resist burning or melting and even self-extinguish once the source of ignition or fire is removed from it. 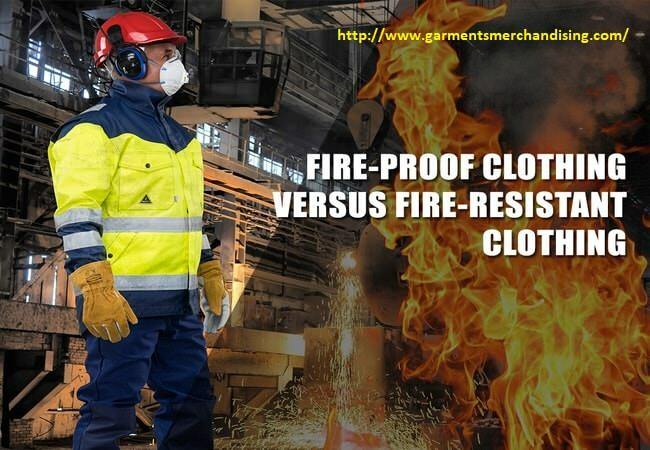 Fire-resistant clothing is also referred to as FRC by the industry people. Fire-resistant clothing is basically made from two kinds of fabric that are differentiated as ‘treated’ and ‘inherent’ FR fabrics. The former type quiet simply includes the natural or synthetic fabrics that are later treated with a combination of flame-retardant chemicals to give them the flame-resistant properties. Whereas in the case of inherent fabrics, the fabric itself is made from fibers that have flame-resistant qualities and this resistance is ingrained into the molecular structure of the fiber by engineering retardant compounds into a permanent chemical change inside the hollow core of a fiber – creating an all-new fabric with FR characteristics. However, the quality of the fire-resistance in any fabric is dependent on several other factors as well such as weave, weight, texture, the strength of the fabric, and/or flame-retardants used in the treatment. Similarly, there are varied determinants involved in assessing how long an FR fabric or clothing can uphold its flame-resistance. For insistence, the quality of the fiber used, quality of the fabric construction, the strength of the flame retardants used as well as the care and caution practiced in using and laundering the clothing. Fire-resistant clothing is sometimes also called fire-proof clothing which is not very common, neither technically correct. The actual protective clothing is always really flame or fire resistant and the term “fire-proof” is only at times used interchangeably. But this is not a term used by industry people as it can be misleading, and as such fire-proof clothing is nothing but fire resistant clothing. The phrase “fire-proof clothing” implies a type of clothing that will not burn or set on fire, however that is not true. As the fire-resistant clothing, while definitely resists flame and heat, and minimizes the risk of potential injuries from clothes burning near the skin, it can still burn if the source of fire is not removed. The only cloth said to be fire-proof is Glass cloth made from 100% woven extremely fine fibers of glass, also called woven Glass or fiberglass. But again, the quality of the fabric comes from its extremely high heat and fire resistance (up to 2075 degrees Fahrenheit or 1121 degrees Celsius) which virtually renders the cloth non-combustible. However, fiberglass has only ever been used in proactive and high-performing FR textiles for blankets and curtains etc., but not for personal protective clothing. This is why; so far the performance of fiberglass clothing against workplace hazards is not tested and documented in real environments. Where the Difference Comes in? As mentioned before, all fire-resistant clothing, while able to resist fire and heat, can still burn under continued exposure to a flame. By the National Fire Protection Association (NFPA) standards, Fire-resistant clothing should be able to minimize the risk of injury down to 50%, for it to pass compliance tests. So any guarantee for flame retardancy of a fabric by the manufacturer has to do with the improved resistance of the cloth to fire and heat. So under standards set up by NFPA, the manufacturer’s Certificate of Flame Retardancy is a verification of the fact that the fabric possesses fire resistance and has been tested for compliance to minimize burning and self-extinguish flames upon removal from the source of the fire. Fire-resistant fabrics are also sometimes termed fire-retardant fabrics, these are just fabrics treated with fire retardants to instill resistance to fire and heat. The fabric itself is not fire-retardant, it would be fire-resistant. Another term used for treated synthetic fabrics is “durably fire-retardant”, where the polyesters are treated with a non-water-soluble chemical during the manufacturing process. Whenever a fabric is labeled “durably flame retardant”, “inherently flame retardant” or “permanently flame retardant”, it means the fabric will retain flame retardancy for life. The range of fire-resistant materials includes Aramids (para and meta), FR cotton, coated nylon, FR wool, leather, carbon foam (CFOAM), Melamine, Modacrylic, Polyhydroquinone – dimidazopyridine, and Polybenzimidazole (PBI). Remember that some untreated materials are naturally more resistant to fire such as wool and silk, these are difficult to ignite and may even self-extinguish, compared to other untreated natural fibers such as cotton and linen, that are not only quick to ignite but also cause a fast spread of fire. Whereas certain synthetic fibers, including certain polyesters, are slow to ignite and may also self-extinguish, but they typically melt rather than burn. So it is beneficial to remember that natural fabrics that use a combination of natural and synthetic fibers, like cotton-polyester blends, are prone to cause a lot of damage with the quick burning and flame spread of the natural fiber coupled with the melting factor of the synthetic fiber. You may follow: What Types of Quality Control Tools & Equipment Used in Apparel Industry? Category: Garments Production Tags: Flame resistant clothing definition, What does flame resistant clothing mean?, What is a flame resistant fabric?, What is flame resistant clothing, What is flame resistant fabric?